Islamabad 05 April, 2019:- Both Egyptians were crowned Champions in International Squash Tournaments played at Mushaf Squash complex, Islamabad. 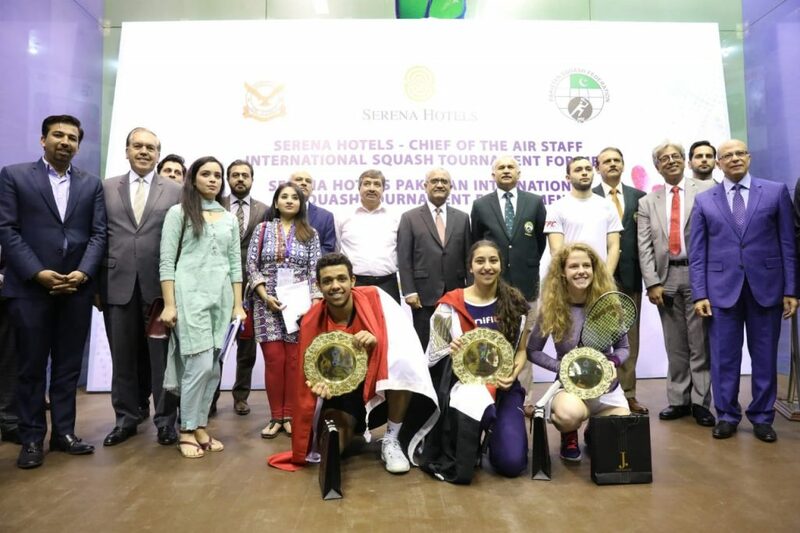 Mostafa Asal won Chief of the Air Staff – Serena Hotels International Squash Tournament for Men while Farida Mohamed clinched Serena Hotels – Condor Pakistan International Squash Tournament for Women. The final of Chief of the Air Staff – Serena Hotels International Squash Tournament for Men category was a thrilling contest between Youssef Soliman and Mostafa Asal. Youssef Soliman dominated his opponent from the first game and easily won it with the game score 11/8. He consolidated his grip on the match by winning second game with the game score 11/07. The third game was convincingly won by Mostafa Asal with the game score 11/2, giving the spectators the prospects of a close finish. Mostafa carried his superb form in the fourth game as well and gave only 01 point to his opponent, taking the match to the wire. Mostafa Asal also won fifth and final game with the game score 11/7 and clinched the prestigious title. The match lasted for 70 minutes. Earlier, the final of Serena Hotels – Condor Pakistan International Squash Tournament for Women was played between Farida Mohamed (Egypt) and Cindy Merlo (Switzerland). Farida Mohamed won the first game with the game score of 11/8. Cindy came back in the match by winning the next game with the game score of 11/9. The third game was also fiercely contested between both the players, however, Farida managed to take the lead in the match by winning the game with the game score of 11/9. The fourth game was also won by the Egyptian with the game score of 11/5, earning her the coveted trophy. The match lasted for 33 minutes. Pakistan Squash Federation organized these international events in collaboration with Pakistan Air Force, Serena Hotels and Condor Pakistan, which witnessed top ranking international players from all over the world. The Men’s event carried a prize purse of US$ 30,000/- whereas Women’s event had US$ 10,000/- prize money. Air Chief Marshal, Mujahid Anwar Khan, Chief of the Air Staff, Pakistan Air Force, was the Chief Guest at the occasion. Ambassador of Egypt, H.E. Ahmed Fadel Yacoub, former World Champion Mr. Qamar Zaman and CEO Serena Hotels, Mr. Aziz Bolani were also present.